Suitable for vegetarians.Recipe No.86 We wanted to give a little glory to the humble bean. In Latin American cuisine, these hearty little ingredients can be relied upon to provide soothing smoothness in a world of sharp flavours and vibrant tastes, so we decided it was time to shine a light on their simple goodness. The All-Natural deliciousness is all in the Detail. Shape: named in homage to the original Mexican Tostada - the large circular tortilla that's toasted and then enjoyed heaped with fresh, tasty toppings. Texture: finest White corn masa, packed with chickpeas, adzuki, garbanzo, and red kidney beans, is rested then gently Toasted for a smooth, creamy texture. 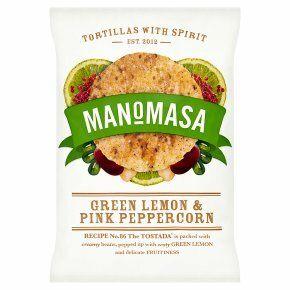 Taste: the creamy bean flavours are enhanced with just a splash of zesty Green Lemon and a twist of gentle Pink Peppercorn for a simple chip that's impossible to ignore. Savour: add a twist to the classic Mexican breakfast 'huevos rancheros', by serving with fried eggs, tomato Chilli Sauce, rice and guacamole.